Traveling can be an exhausting business. After White Sands and the long drive through burning hills, we stopped just north of Albuquerque for the night. If you travel by RV, the casinos can be a great place to stop. They’ll take you at all hours (I think it was nearly 2 am for us) and we had access to an electrical hookup and dumping station to boot for around $10. 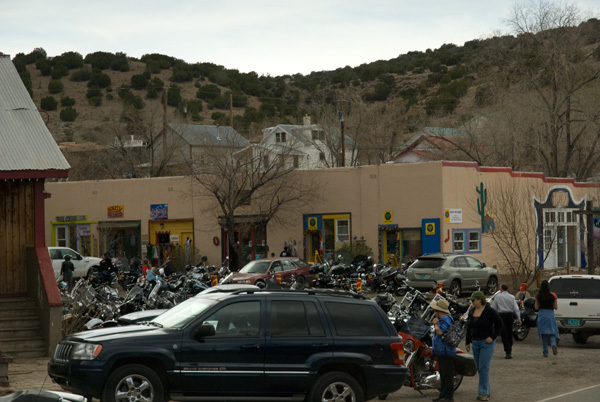 Santa Fe is like two cities – the one every city knows with the long road of hotels and big box stores; the other, where all roads meet, is the ancient town of old adobes and narrow streets sitting at the base of the mountain’s embrace. I recommend a few days (we only had one) in order to have a day each to absorb the art, the architecture and the walking trails in the old part of town. 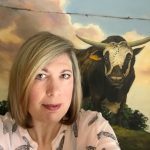 One of my top priorities was to visit the Georgia O’Keeffe Museum while in town and see some of her originals. The museum is a labyrinth of small rooms filled with drawings and paintings of sensual landscapes and flowers. I must say that O’Keeffe’s paintings are both intense and sublime. I could feel in them the calm of New Mexico. I can see how an artist could spend a lifetime uncovering a vision to describe it. Building in Santa Fe is now restricted to adobe architecture only. The soft corners and smooth walls seem to blend into the mountains. Along with being very much a hot spot for the artistically inclined, the underground here is very ‘west coast’. Bikes, bongs and health food dominate a community that would otherwise, not be large enough to attract a Whole Foods! The center of the Old Town is filled with Galleries, Native artists and old Churches. 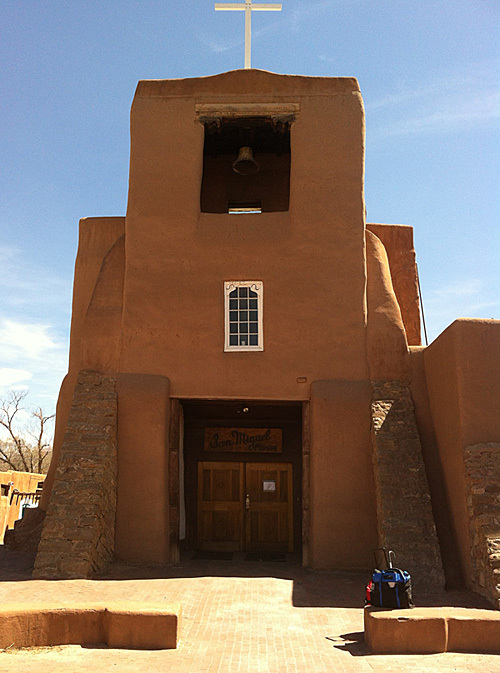 The oldest is the c. 1610 San Miguel Mission Church, which sits beside one of the oldest houses in North America dating to 1649. The old house with its rough walls and wooden barriers reminded me of the houses in old Cairo. No photo here because it needs to be a painting. 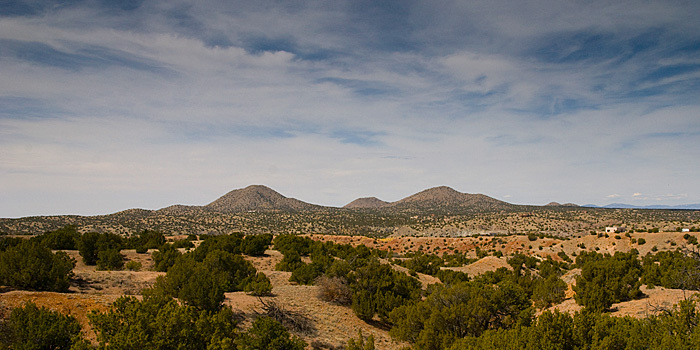 New Mexico lays claim to a number of the oldest structures and residences in the U.S. 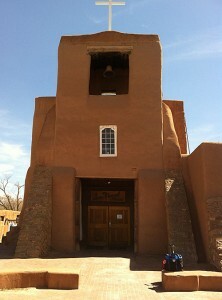 I am planing a visit to one of the oldest continuously inhabited places in Taos later this year. Canyon Road is the main art gallery district and I’ll agree that it is pretty consistent in quality, but there is a little too much contemporary (read modern) art for my taste. What is good, however, is exceptional. One of my favourite spots is the studio/gallery of Jordan+Roybal Fine Art at the entrance to Canyon Road. These artists have each mastered the use of subtle visual textures in a completely different way. The painting outside the gallery was enough to stop traffic. The other gallery that is a necessary visit is the Sugarman-Peterson Gallery on West Palace Ave. It is not on Canyon road but in the center of Old Town. 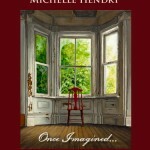 The prices there are well out of my range, but the work is outstanding. 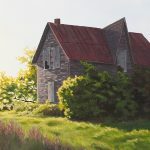 Surrounded by paintings from the likes of Dennis Wojtkiewicz, Terry Strickland and Susan Romaine in their full size and stunning glory, it made me wish I had the means to take one home. The old road between Santa Fe and Albuquerque is littered with ghost towns and winding roads that appeal to the motorcyclist. Some of these old, partially abandoned mining towns are seeing a revival through collectives of artists and tourist attractions. Old adobe houses with magnificent courtyards are being restored in places like Cerillos and Madrid. The RV was slow to snake its way up and down giving me a lot of time to absorb the textured landscape full of a rainbow of rock and scrub. Tiny ruins grasping a hillside would appear, while our engine heated up and roared around a narrow corner. Fences between us and ranches seemed like more determined barriers than the multicoloured mountains themselves. The sky was slightly cloudy, dusting the tops of distant mountains like wisps of cotton blocking the sun only enough to turn their distant oranges to indigo. It is no wonder artists are attracted to this place. Sunday night returned us to Albuquerque and I had one part day left to visit the Petroglyphs and Old Town Albuquerque before beginning the long ride home. Next post…. 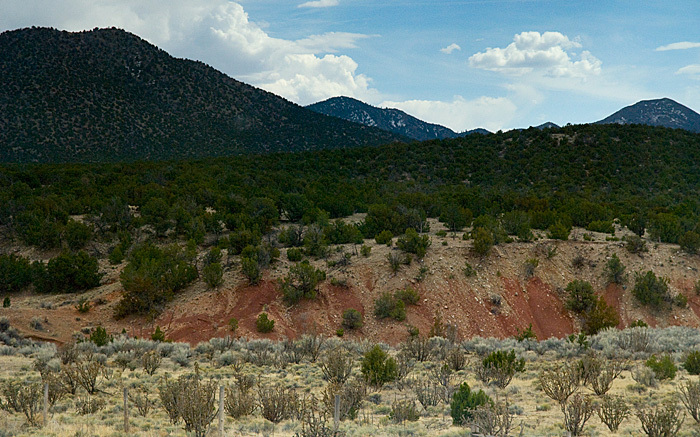 Albuquerque, the Petroglyphs and the Rattlesnake Museum! 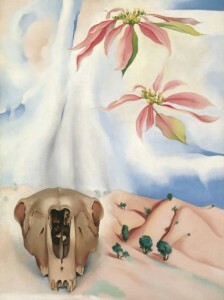 Gerogia O’Keeffe, What a fabulous artist! Gosh, I don’t know which to comment on. The bottom landscape photo looks like tapestry, gorgeous. The top landscape, stunning. Can you resist painting them? You are making me want to travel. And especially with the chance to see the Georgia O’Keefe’s. Wow! LOL! I have held back even better ones to be painted… These may yet sow up as little ones! My library has expanded by a couple Georgia O’Keeffe landscape books. Those are my favourites. Glad I can inspire. I’d love to see you down here! I am loving these photos and words of your travels 😀 It is great seeing pictures of a place I will probably never see in person. Artscapes has been Travelscapes, lately! LOL! I am happy you are enjoying it.